A simple stick is a dangerous, even lethal, weapon in the hands of a skilled weapons expert. 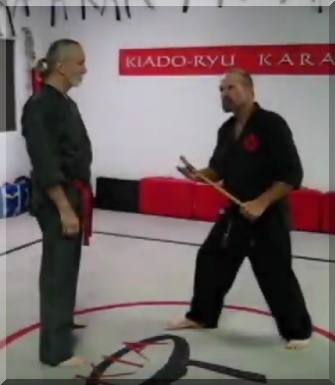 This short 1 minute YouTube video shows four ways to defend against a stick attack as taught at the Karate Institute of America. Two of the techniques show how to use the stick offensively, if necessary, after the opponent is disarmed. The Black Belt playing the role of the “scary bad guy” in the video, is 5th Degree Master Kim “Cultivator” Thomas, the only Black Belt at the KIA holding a “Master” Dan title in its 40 year history. Master Thomas is quite the actor, as the video proves. “Are you hearing this, Hollywood?” Prepare that Oscar! Video production courtesy of the KIA’s own Adam “Frog” Mahan. Thanks Cultivator and Frog. This is a lot of fun! This said, these stick disarm techniques can be dangerous, so don’t try them without proper training.